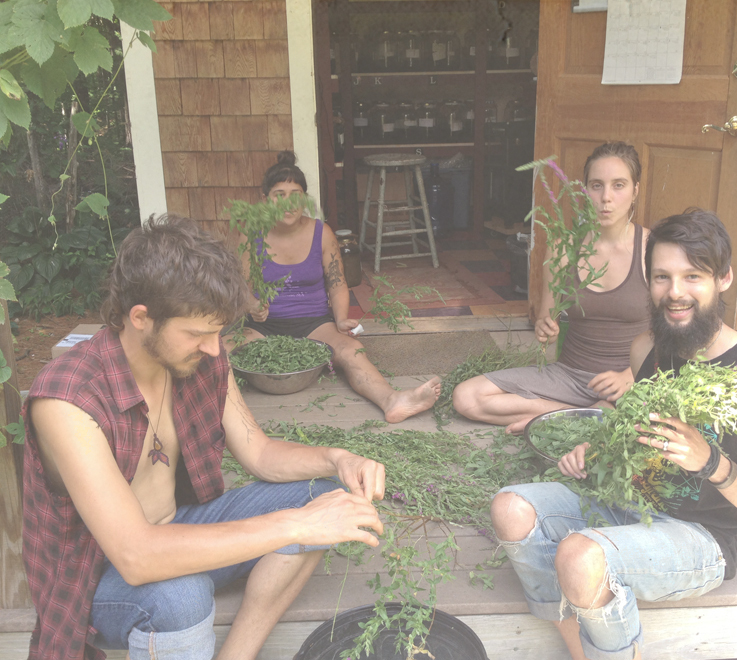 Cultivating real-time experience, honing skills, and gaining confidence as a practicing clinical herbalist. Learning through interaction and shared experience in a group setting with other practicing herbalists and real clients, all guided by Chris Marano, a clinical herbalist with over twenty years in the field as clinical herbalist and over thirty years of teaching experience. Over the course of a year, students will experience and improve health intake skills, bedside manner, diagnostic and communication skills, client relationship and follow-up, and will have opportunities to create wellness protocols and herbal formulas,and have access to a master herbalist’s experience, wisdom, and apothecary. Indoor course offered four times per year (3 Wed. classes, 5:30-8:30PM). Certificate students must complete four units. Students must complete one diagnostic class. Students must attend at least half of the scheduled walks. (Outdoor Classes). Students must regularly attend Monday group garden work day during the growing season (April-October). A year-long class, meeting once per month for a total of 13, each class three and half hours long, plus individual time with the instructor. Limited to 10 students. The “Advanced Clinical Herbal Practicum” is the flagship course for the Third-Level program, “Cultivating Clinical Herbalism.” Cultivating real-time experience as a practicing clinical herbalist, in a group setting, sharing learning and knowledge, growing skills together, all guided by Chris Marano, a clinical and community herbalist with over twenty years in the field as a practitioner and over thirty years of teaching experience. This course is open to Clearpath School of Herbal Medicine certificate path students who have successfully completed Second Level program, “Cultivating Community Herbalism.” Also by invitation (and interview) to qualifying advanced herbal students from other schools, herbalists and health-care practitioners who have not taken the Clearpath School program. Class One: Introduction/Setting the Tone. Creating safe, sharing space. Getting to know each other as fellow students and herbal clinicians. Chris Marano will set the tone and stage, bringing everyone on to the same page with a whirlwind review of herbalism, the ‘lenses’ we use to help in that effort (focus on Western, Chinese, Native American modalities), and the principles and protocols of being a practicing herbalist. Chris will also explain the flow of the course, and we will all figure out the details of the schedule. Class Two through Twelve: Group Clinic Experience. See explanation. NOTE: Chris will lead the first of these classes, and then pass the ‘baton’ to the next herbal practitioner in preparation for third class. Class Thirteen: Putting it All Together and Graduation: debriefing, discussion of how it all went and where it goes from here. Last 30 minutes: Summarization, relevant information riffing of what transpired during the two-hour consultation. Lead Student Clinician Responsibilities: Even though it is a group situation, and an experienced clinical herbalist is present, the lead student for that day is in charge of facilitating the class, which includes being aware of time once you are on. Two hours is plenty of time. Be responsible as an herbal health-care practitioner in presenting yourself on that date: physical appearance, preparedness, as if you were meeting a first-time client in your office, which you are. Be prepared. Study the client’s health intake information before the meeting and research anything unfamiliar, including diseases, syndromes, lab results, pharmaceutical medications, etc. Be prepared for being lead facilitator. Come with appropriate paperwork. Also responsible for making information available to the rest of the class. Be prepared to open the consultation to group Q&A with the client after finishing your initial round of questioning. This includes harmonious facilitation of the group taking diagnostics (tongue, pulses). Be responsible for creating a Wellness Program for the client, suggesting help in areas of lifestyle, nutrition and herbal remedies. You will have ninety minutes of direct, one-on-one mentoring time with Chris within two weeks after the group class. Wellness Program will be assessed by Chris before it is sent to the client. Be responsible for making custom-blended herbal remedies for the client, utilizing the Clearpath Herbals apothecary for tinctures. Be responsible for finding a new client for the next class and the next lead clinician, after passing approval by Chris. Lead clinician is also responsible for answering any preliminary questions the client might have about the process, or about herbalism in general. Be as prepared as the lead student, just as a stand-in is prepared to replace a sick actor. Study the health intake information and research any areas with which you are unfamiliar. Be courteous and respectful of the space, the client, the lead practitioner. Give the experience your entire, undivided attention. Be aware of time and energy during the group Q&A section. Be ready with relevant questions or ideas, but do not dominate the time. To be handed to me within two weeks of the group consultation: Create a wellness program outline for the client, complete with your assessment and suggestions in areas of lifestyle, nutrition and herbs. Oversee the entire program and class. Emcee each class. Thirty minute introduction and lecture, thirty minute wrap-up and lecture. Covering new material, practical clinical skills, “a peek inside the head” of an experienced clinical herbalist in action. Ninety minutes each month devoted to lead student clinician mentoring and apothecary time. Assessing the written homework from each support student clinician each month. Individual end-of-year assessment by Chris, areas of strength, areas needing attention. Real time experience with actual clients. Group share experience with other students and peers. Personal assessment of all written work by Chris Marano. If professional membership in the American Herbalist Guild is one of your goals, then this course offers official mentoring time and clinical experience that will be accepted by the Guild. If agreed upon by client, lead student clinician has the option of taking on this person as an ongoing client, in effect building an actual clientele base.